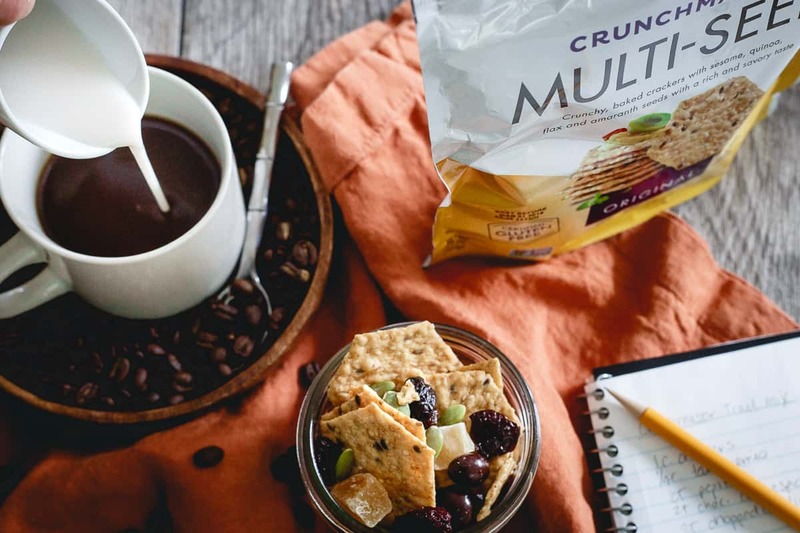 This cracker crunch trail mix has chocolate covered espresso beans in it for a delicious mix of sweet and savory to satisfy any snack craving. Suburbia definitely has its pros compared to the city (land, open spaces, farms, no honking car horns, sirens or garbage truck noise at all hours of the night) but, one of the things I really envy about all the city dwellers is the ability to work in a cute coffee house or cafe a walkable distance from their home. 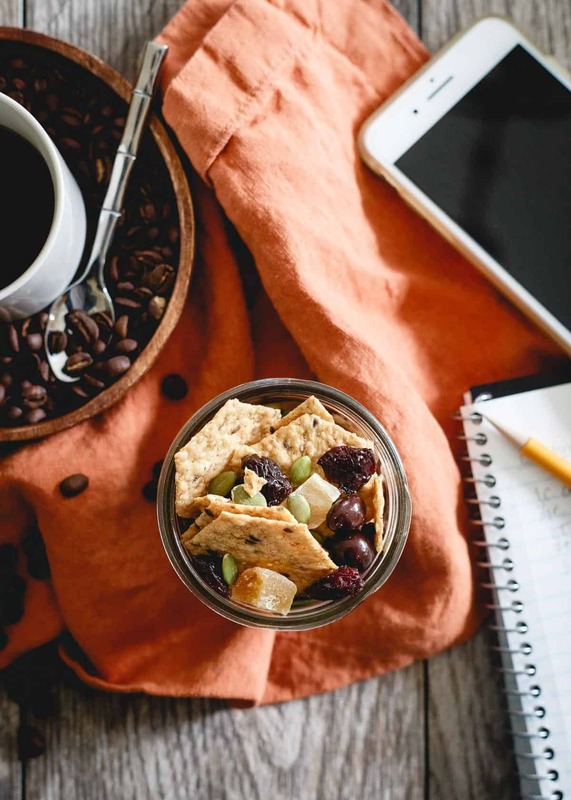 *This Coffee House Cracker Crunch Trail Mix recipe is sponsored by Crunchmaster, a 2017 partner of Running to the Kitchen. All content and opinions are my own. That doesn’t exist up here in suburban New York. I can’t walk anywhere from my house (ok, I guess technically I could but it’d be on main roads, sans sidewalk and all I’d get to would be a gas station, Chinese restaurant, McDonalds and a handful of delis – all of which would take me over 25 minutes on foot) and while working from home is amazing 95% of the time (heck yes to pjs on the couch at any hour of the day), there’s that 5% when I really crave putting on real clothes, being somewhere in public with other human beings, sipping on some caffeine I didn’t have to make myself and powering through my work to-do list in an eclectic, hipster-vibed cute space. When Dunkin’ Donuts, Starbucks and Panera are your main “coffee shops” though, it’s barely incentive enough to move from the couch. 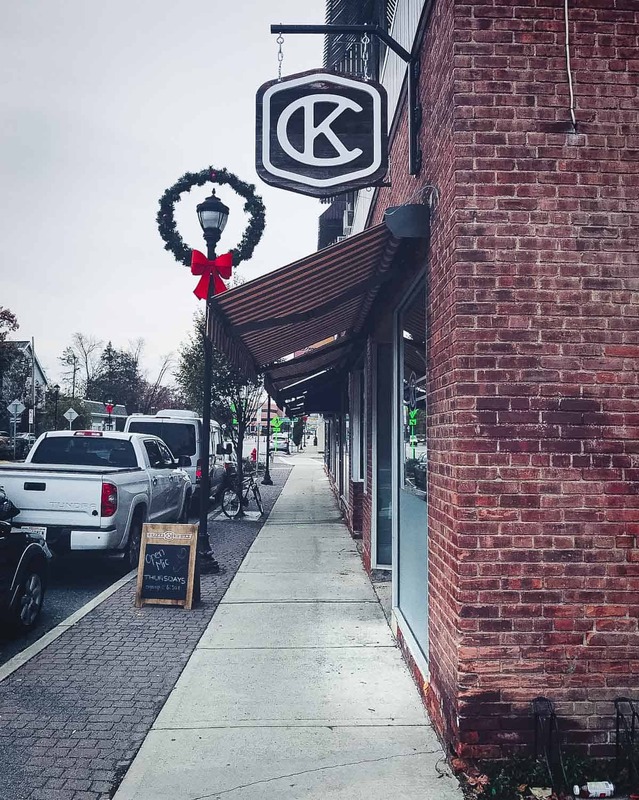 All that changed recently when I found Krafted Cup, a local-ish (it’s a 20 minute drive away) coffee house joint right on the outskirts of Vassar College which happens to be 2 minutes down the road from my chiropractor’s office that I’m at every Thursday morning. When I finally realized this, I knew I had to check it out after my usual Thursday morning back-cracking session (my chiro would cringe at me using that term). I walked in, ordered an Americano with a bit of steamed milk on top (something that’s always met with confused looks at DD or Starbucks but wasn’t given a second thought here – immediate sign of decent coffee place), picked a table towards the back of the shop and happily sat there for 3 hours while powering through my to do list like never before in the 4 years I’ve worked for myself. Amazing what a change of scenery and no fridge full of food 10 feet away to distract you will do for your productivity. I’ve been back a handful of times since, trying hard to make it my Thursday morning routine now when my schedule allows. The one thing I learned though after that first rookie visit was that 3 hours of work requires snacks, not just coffee and if I was going to try and resist the amazing looking muffins, danishes, croissants and bagels in the front, it needed to be a good snack. 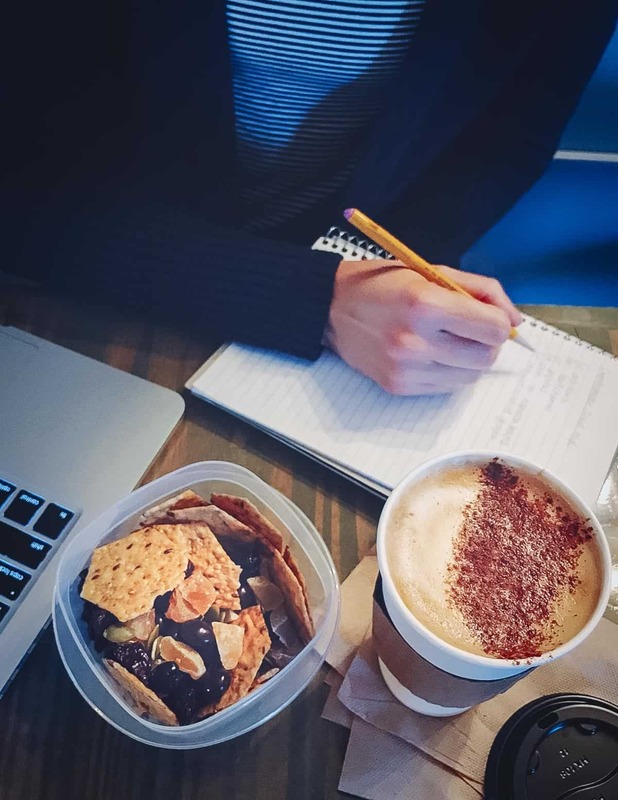 This coffee house cracker crunch trail mix hits on all of those points. Using Crunchmaster multi-seed original crackers seemed like the perfect fit for this #NewBeginnings adventure of mine (see more #NewBeginnings posts and adventures here with this pear apple butter, this Chinese five-spice plum jam and these strawberry basil cider slushies) to the local coffee shop and it was a fun change up to use crackers as a base for trail mix rather than nuts. 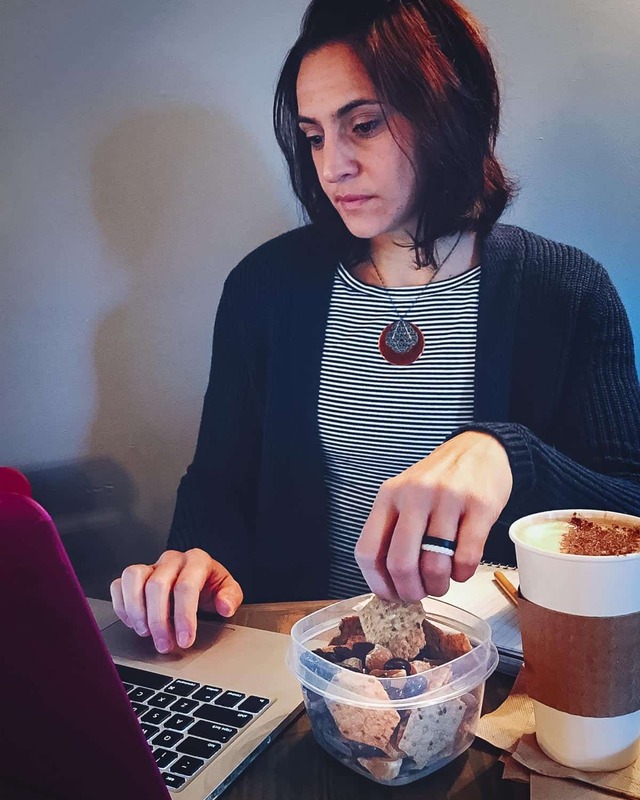 Their crunch is far more exciting to snack on in my opinion and if you’re watching your fat intake like I am on a macro-based nutrition plan, a much better option. 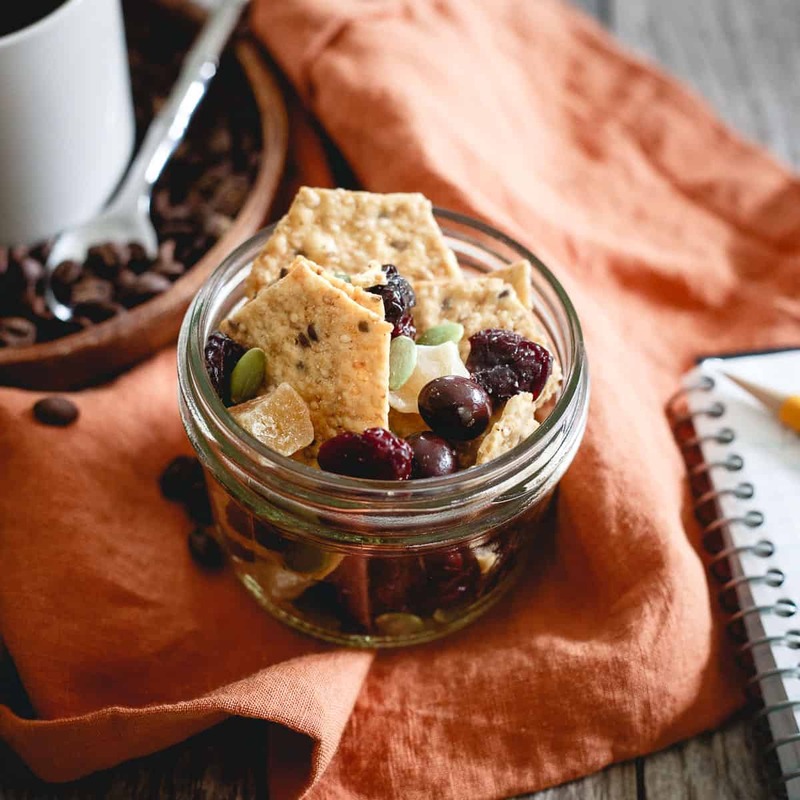 To go along with the coffee theme, I added dark chocolate covered espresso beans, an ingredient you normally wouldn’t think of combining with a savory cracker and pepitas but it weirdly works. The pop of sweetness from the dried cherries and candied ginger bring everything together. This cracker crunch trail mix takes all of 5 minutes to throw together. Pair it with your favorite coffee house drink and enjoy while attacking that to-do list. Or, just people watching for a few hours because I’ve found coffee houses are really good for that too. Love this Cracker Crunch Trail Mix recipe? Try other trail mix ideas: trail mix popcorn (<– a favorite for sneaking into the movie theater!) or, this easy trail mix recipe (great for lunchboxes). Combine all ingredients in a small bowl and gently toss together. Eat or store in an airtight container at room temperature. Oh, I love this idea. Well done. Oh, I get SO easily distracted when I’m at home – the cat, the laundry, the little things that are never an immediate priority, but just deter me from my work to-do list. I think a change of scenery would do me good and you can be sure I won’t be leaving home without this trail mix! I lovelovelove Crunchmaster! And using them in trail mix? GENIUS. We are so Crunchmaster obsessed! This is a much better alternative to my usual snacks! Love it! I just realized I have made this about 4-5 times now and I have never left a comment! Obviously, I am a fan and I think this is a great mix of flavors. It’s probably a little too “high brow” for most of my family but I shared some with my sister-in-law and she loved it too. The ginger is something I would have never thought of but its so satisfying back to back with the espresso beans and sweet stuff. Thanks! That’s awesome! Funny enough I’m headed to that coffee house this morning to do some work :) Glad you’re enjoying it as a snack!